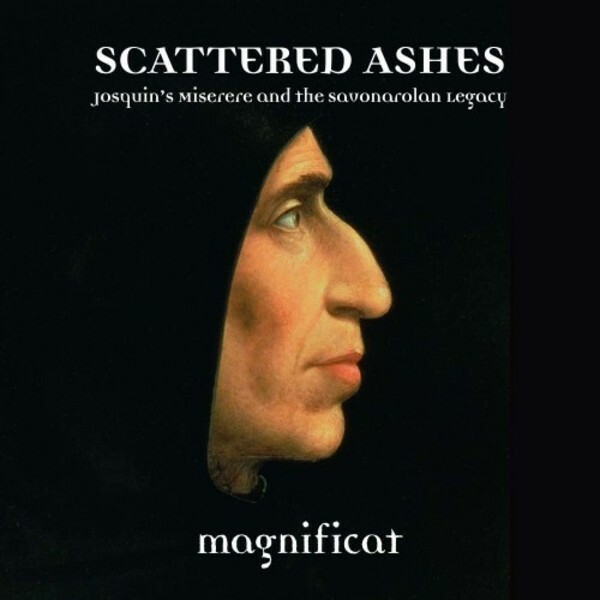 Magnificat’s 25th anniversary recording, Scattered Ashes, features contrasting and parallel works of great passion inspired by the meditations of the infamous Dominican friar, Girolamo Savonarola. These Latin settings by eight great vocal composers of the 16th century display a variety of scoring, textures and harmonic language that is mirrored in their intensity and attention to detail. Josquin’s Miserere, referred to as ‘epic’, ‘massive’, ‘courageous’ and ‘bold’ with similarities in stature and significance frequently drawn between the music of Josquin and Beethoven, opens the programme. Josquin’s musical architecture, and his sensitivity to the text, combine to produce a work of astonishing delicacy, with kaleidoscopic twists and turns, rich and subtle use of texture and variety exploiting and illustrating the text with a heartfelt empathy. Both challenging and thrilling to sing, Josquin’s Miserere perfectly demonstrates why Magnificat’s world-class reputation for clarity, flawless intonation and purity of tone is second to none. Directed by Philip Cave, Magnificat is one of the world’s premier vocal ensembles specialising in the restoration and performance of neglected choral masterpieces of the 16th and 17th centuries. Its recordings have met with huge critical acclaim: Tallis’s Spem in alium was hailed as ‘quite the best performance that I have heard' by Gramophone and was ‘First Choice’ in Building a Library on BBC Radio 3's CD Review, while Victoria’s Officium Defunctorum was named ‘Critics’ Choice’ by Gramophone and chosen by The Rough Guide as one of its ‘100 Essential Classical CDs’. Magnificat has also recorded works by Gesualdo, Guerrero, des Prez, Rebelo, Allegri and Palestrina, as well as Latin sacred music by Robert Parsons, Robert White and William Byrd and two recordings to commemorate the 450th anniversary of composer Philippe Rogier. Before his execution in 1498 for heresy – he had spoken out against a corrupt pope – the Dominican friar Girolarno Savonarola wrote meditations on two Psalm texts that were widely circulated and set to music by the greatest late-Renaissance composers. This choice selection ranges from Josquin’s epic Miserere mei, Deus to Byrd’s Infelix ergo, every work a model of emotionally moving expressive intensity. The singers exquisitely shape and blend each one.